Even before the final votes are taken the verdict is in: The winner of Maryland’s 2015 budget fight, by a wide margin, is Republican Gov. Larry Hogan Jr.
Actually, Hogan was playing with a stacked-deck. Maryland governors almost always win these budget fights because they’re the only ones who can add money to programs and priorities; the legislature has the power to subtract, period. 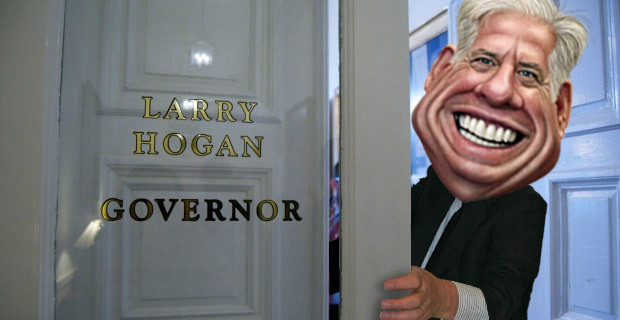 But remember where Hogan started: He was handed a wildly out of balance budget by outgoing Democratic Gov. Martin O’Malley, who had neglected to take strong steps to stem the growing deluge of red ink on the state’s books. Even worse, projections called for far wider deficits in future years. O’Malley wasn’t up to the task of pulling back hard on the spending reins because he was preparing to leave office and run for president as a darling of the Democratic liberal left. So O’Malley passed the baton and dropped the budget mess he had created in Republican Hogan’s lap. Thanks to the work of career budget analysts and former state Sen. Bobby Neall, Hogan whipped up a budget-balancing plan in about six weeks. It was a tough but judiciously pared-down financial blueprint that went nearly all the way toward eliminating Maryland’s chronic and widening structural gap between revenues and spending. Hogan also called for long-term steps to ratchet down future spending growth in costly education and health programs. Democratic legislators didn’t bite on that last Hogan proposal. Yet there is nothing they can do to stop the governor from shrinking budget increases for state and local aid programs in each year of his administration. The result is a half-loaf victory for Hogan, which is impressive for a Republican in a heavily Democratic state. If he persists over the next three years, he’ll almost certainly pick up the other half of the loaf — and more. Hogan came into office promising to squeeze excesses from the state budget so he can lower taxes. He’s started down the first path with considerable success. The tax-cut pledge will be infinitely harder to fulfill, as Democrats have shown this legislative session. In office, Hogan has proved to be a realist. He recognized that without a truly balanced budget that slowed spending growth, there is no hope of gaining meaningful tax reductions. He’ll have to keep shaving Maryland’s spending — and especially the state’s overly ambitious and costly capital spending program. Ever-rising health and education costs remain enormous challenges too. Still, the direction of future Hogan budgets is now transparent to both conservative Republicans and liberal Democrats. To the relief of Democratic legislators, the new governor isn’t a scorched-earth program cutter. He understands the importance of the social safety net, of education advancements and offering improved health care options. He also understands the dynamics of Annapolis. Hogan knows he must share power with the heavily Democratic legislature. He must find common ground and avoid the mistake of the last Republican governor, Bob Ehrlich, who proved too partisan and confrontational. So far, Hogan is succeeding. He’s won this year’s budget battle, regardless of the final negotiations over legislative demands for restoration of funds for public schools and health care. The new governor has turned around Maryland’s bleak fiscal forecasts in a matter of months, not years. Once legislative adjournment comes on April 13, Hogan will have the rest of the year to implement spending hold-down ideas, analyze where downsizing makes sense, educate lawmakers on sensible ways to shrink the cost of state government and start eliminating excessive and harmful business regulations. Not bad for a guy given almost no chance of winning the governorship a year ago — or of working constructively and peacefully with legislative leaders of the opposite party.